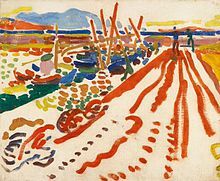 "Derain" redirects here. For the crater on Mercury, see Derain (crater). For the region of Mercury, see Derain quadrangle. 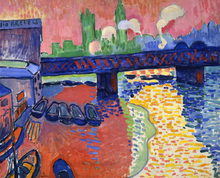 André Derain, 1906, Charing Cross Bridge, London, National Gallery of Art, Washington, D.C. The 1920s marked the height of his success, as he was awarded the Carnegie Prize in 1928 for his "Still-life with Dead Game" and began to exhibit extensively abroad—in London, Berlin, Frankfurt, Düsseldorf, New York City and Cincinnati, Ohio. Derain's London paintings were the subject of a major exhibition at the Courtauld Institute from 27 October 2005 to 22 January 2006. ^ Sabine, Rewald. "Fauvism". from Timeline of Art History. New York: The Metropolitan Museum of Art, 2000–. Archived from the original on 14 December 2007. Retrieved 2007-12-17. ^ "International Painting and Sculpture - Le Cavalier au cheval blanc". National Gallery of Australia. Retrieved 2007-12-17. ^ a b "Works on View: André Derain". Guggenheim Hermitage Museum. Archived from the original on 25 January 2008. Retrieved 2007-12-18. ^ "Stein, The Autobiography of Alice B. Toklas". ^ "Australia Dancing leaps into Trove". Archived from the original on 2011-08-08. ^ Dorléac, Laurence Bertrand (2008). Art of the Defeat: France 1940-1944. Los Angeles: Getty Research Institute. pp. 83–87. ISBN 978-0-89236-891-4. Retrieved 14 February 2012. ^ "André Derain Biography". Namen der Kunst. Art Directory GmbH. Retrieved 2008-01-03. ^ Brettell, Richard R., Paul Hayes Tucker, and Natalie Henderson Lee (2009). The Robert Lehman Collection. III, III. New York, N.Y.: Metropolitan Museum of Art in association with Princeton University Press. p. 253. ISBN 9781588393494. 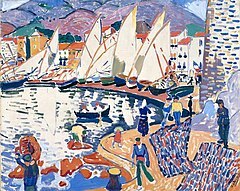 Wikimedia Commons has media related to André Derain.